Life has a way of getting in the way at times and the last few months have been intense. In addition to moving, I was deeply involved in completing a research paper for my Masters degree. Needless to say, there wasn’t enough hours in the day to get to blogging…but I’m back! A few nights ago, I had the pleasure of being invited to Min New York to discuss fragrances with a few like-minded gentlemen. In attendance was Harry Sheff from Cocktails and Cologne, Andrew Buck from Sentrist, Chad Murawczyk from Min New York, Carlos Powell, who runs the private Facebook group Peace Love Perfume and Cody Sulaimana of the YouTube channel Drac Doc. We were interviewed for an article that should be out in a few weeks in the UK Sunday Times. 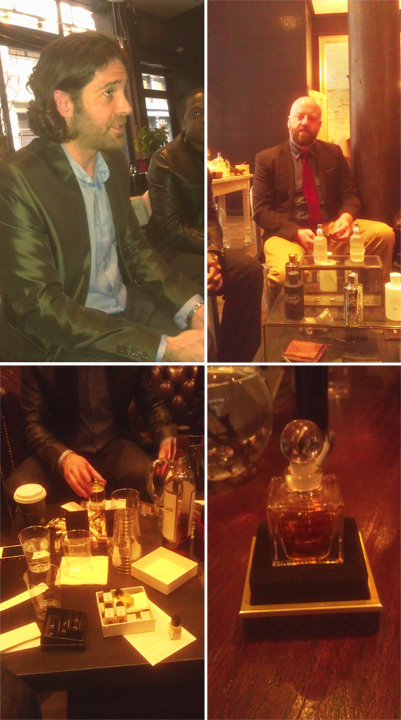 What I enjoyed most was our collective passion for cologne and it was really interesting to hear everyone’s stories. We all had different tastes but agreed, smelling good is the best accessory. Once the story goes live, I’ll share it. In the interim, stay tuned. I’m back. This entry was posted in Interview and tagged Amouage, Men's Colgone, Men's Fragrances, MIN New York. Bookmark the permalink.